Several weeks ago, Dos Chinos tweeted that they were now serving Vietnamese Iced Coffee (or Cafe Sua Da) as part of their menu. 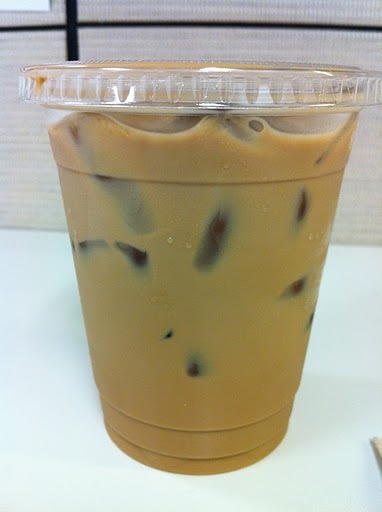 I love Vietnamese Iced Coffee, but unfortunately, there are a lot of places that don’t serve it well. Overall, the balance needs to be rich, bold and flavorful, not separated (as in, you can taste the separation of water, coffee and milk). The best cafe sua da is best described as drinking liquid dark chocolate. Sublime!! The change in description piqued my curiousity, so I decided to give it a try. The result? Their coffee met all three of my criteria. It had a nice, thick quality to it and really had a well balanced flavor. Though, not the best I’ve tried, I would definitely order it again if I don’t have time to make it up to Little Saigon to get the good stuff. As for their claims of begin “Super Strong?” Well, I’m not bouncing against the walls, but it has certainly helped me get through the rest of this afternoon much easier.